Looking for an affordable hotel in central Boston close to museums, Fenway Park, Symphony Hall, and Northeastern University? The Midtown Hotel, in Boston's ritzy Back Bay neighborhood offers you a great value in a top location near Prudential Center and within a 10-minute walk of Downtown. The Midtown also an attractive and affordable option when you're looking for inexpensive Boston hotels near Fenway Park. From its location near the southwestern corner of Back Bay, the Midtown Hotel is convenient to the Christian Science Plaza with its reflecting pool and Mapparium, and super Newbury Street shopping. 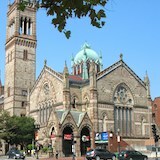 In addition, the Midtown Hotel Boston is close to popular attractions in the nearby Fenway neighborhood. A ten-minute walk will take you to the Museum of Fine Arts, Symphony Hall, Jordan Hall, Northeastern University, and Fenway Park. Great rates - and great value. When you check rates for the Midtown Hotel Boston MA, you'll see why it's considered one of the best choices among inexpensive Boston hotels. Plus, location and amenities add up to great value. And during summer months, you'll enjoy the outdoor swimming pool - one of the few outdoor swimming pools among Boston hotels. Even the daily parking rates in the on-site garage are about half of what you'd pay at other nearby hotels. 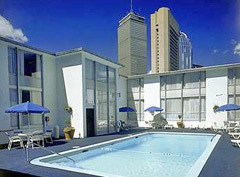 Location - The Midtown Hotel in Boston is convenient to Back Bay, Fenway, and Boston's South End. It's about a 10 minute walk from Fenway Park, and often offers its guests free game day parking. Pet friendly policies mean special treats and a water bowl will greet your pet upon arrival. In addition to being one of the best affordable hotels near Fenway Park and Back Bay attractions, Midtown Hotel is also an easy walk to universities and colleges in the area. These include Northeastern University, Wentworth Institute of Technology, Simmons College, Emmanuel College, Berklee College, the Massachusetts College of Pharmacy, New England Conservatory, Boston Conservatory, and Harvard School of Public Health. Boston University is a bit farther, but certainly walkable, especially the East Campus area. Fenway Park, also to the north, is slightly closer - perhaps a 10 minute walk. Along Huntington Ave, you'll find lots of affordable student eateries and small stores, as well as fancier restaurants in nearby Prudential Center and along other Back Back streets. If you walk a few blocks to the south, you'll be in the trendy South End - where you'll find even more fabulous South End restaurants and the city's hippest boutiques. Why Does the Midtown Hotel Offer Such Cheap Rates? If you're like me, you may be wondering..."Why is the Midtown so cheap? What's, um, missing?" 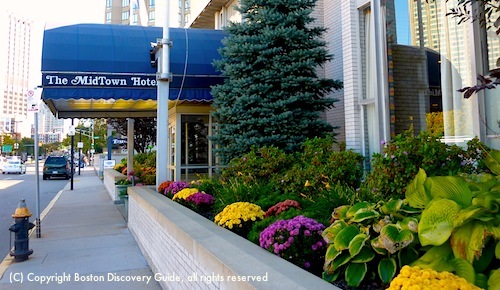 The Midtown is a nice, comfortable hotel in a superb location - but it's surrounded by much more glamorous luxury and high-end business hotels, such as the sleek Colonnade down the street and the nearby Sheraton Boston and Hilton Back Bay. Around the corner is one of Boston's top boutique hotels, the Inn @ St Botolph. In contrast, the Midtown looks like what it is: a former Boston motel from the 1950s. It is literally overshadowed by its higher-profile competitors. Furnishings are comfy, but definitely not luxe. And the outdoor pool, while splendid during Boston's glorious summer months, is definitely not where you'll want to hang out during our, um, frosty winters. Those are the trade-offs. In return, you'll find some of the lowest rates in the city, a super location, comfortable accommodations, and easy access to all the great restaurants, shopping, cultural events, universities, and attractions nearby. And if mid-century design makes you swoon, the Midtown could be your hotel of choice regardless of price. It's the kind of hidden gem that people brag about finding. So now you know about it too! Why Is Fenway Park Special?